There's been a lot of talk about Formenko on here recently and his complete revision of history and it got me thinking about the Pyramids. If we are on the basis of the expanding Earth and there being an expansion event in the 13/14th century why has the Great Pyramid got such detailed Earth information incorporated into it? I mean the measurements and geometry incorporated in the GP are the measurements NOW and not pre-expansion when they were supposedly built. Could it be that they are not old and built a lot more recent than we are told? The figures would surely be all out of sync if the earth expanded AFTER they were built? we are told that the overall dimensions of the Great Pyramid incorporate measurements from which the Earth's size and shape can be calculated, as well as the distance between the Earth and the moon and the distance between the Earth and the sun. So, the Great Pyramid having been built 30 degrees north of the Equator so that as the Earth turns it comes as close as 6.5 degrees to the ecliptic, is in itself a significant statement which is pointing directly to the obliquity of the Earth's polar axis . . .
Also a 23.5º line from the south vertice and 6.5º from the apex intersect at exactly the Kings chamber, the 2 figures incorporated into the GP that show the Earth's tilt and as above the 6.5º to the ecliptic meeting at that specific place. So the tilt according the GP has been there for along time and not happened during a fairly recent expansion. 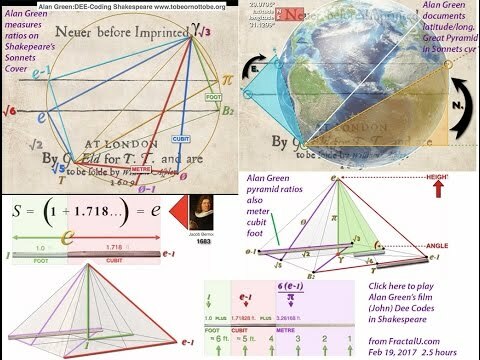 The information detailed in the GP is staggering, John Dee even got involved with Shakespeare, the front cover of his Sonnets book is drenched in mathematical and GP pyramid formulas, some that weren't even thought of for a couple of hundred years. I mean if I were to steer thousands of researches and a few billion people totally of course then making out that new buildings are ancient would probably be the best way. If the expansion issue can be answered then I suppose its what were they? I mean with my limited knowledge I could probably guess they were not for a dead Pharaoh! The shafts point to Orion constellation and this website (https://thenarrowgateweb.com/2016/08/12 ... er-plants/) which is worth a look around suggest the pyramids being built over water (like Tesla's tower in Wardenclyffe) were part of a global network of free energy linking up to the numerous obelisks around the world turning the earths frequencies into electromagnetic energy. And Chris's post about them being some sort of compass for the survivors of Atlantis to find their way home. I also heard about the capstone also called a Ben-Ben being a meteoric rock that could trans mutate lead into gold or could revitalize the dead, the word for Phoenix rising from the ashes is Benu being similar to Ben-Ben. Can this be explained with the expanding Earth? If we are on the basis of the expanding Earth and there being an expansion event in the 13/14th century why has the Great Pyramid got such detailed Earth information incorporated into it? I mean the measurements and geometry incorporated in the GP are the measurements NOW and not pre-expansion when they were supposedly built. Could it be that they are not old and built a lot more recent than we are told? The figures would surely be all out of sync if the earth expanded AFTER they were built? Humanity is only 6000 years old, so it has to be younger than that if humans were the slaves that built it. Also, ever notice that there is no "tide mark" on the pyramids (or any of the Egyptian monuments)? That would indicate they were built post-diluvian. You can take anything and if you look hard enough, find all sorts of "hidden meaning" in it--that was never actually designed into it. The root of the problem is that these are HARMONIC structures. Orbital distances, periods of orbits, sizes of planets... they all form discrete, harmonic ratios (a ratio is "motion," upon which the Reciprocal System is built... ever notice that Helium has atomic displacements of 2-1-0... an octave? Or Argon, 3-2-0... a perfect fifth? or Xenon, 4-3-0, a perfect fourth? Did Larson "design" it this way--of course not! Anything that has any "staying power" in Nature is harmonically resonant. So you can pick the units you want to literally scale those ratios to fit ANY system. Like, duhhh, dude...! Scaled??? In other words, they had to find the right SCALE to make it fit the harmonic patterns associated with Earth--even though it was never designed to be that way. which is worth a look around suggest the pyramids being built over water (like Tesla's tower in Wardenclyffe) were part of a global network of free energy linking up to the numerous obelisks around the world turning the earths frequencies into electromagnetic energy. And Chris's post about them being some sort of compass for the survivors of Atlantis to find their way home. If you want to understand why certain artifacts were built over water--study the orgone research of Wilhelm Reich. All of his devices used to modify weather (DOR busters) had to be "grounded" to running water, which (back then) was living water. There is no credible record of the Great Pyramid EVERY having a capstone, even when it was bright white and shiny new; Diodorus Siculus (c. 56-60 BC), the Pyramid stood "complete and without the least decay, and yet it lacked its apex stone." So you can assume that statements like Ben-Ben, etc., are a lot of Poo-Poo. Once you strip the data from it's MK Ultra origins, you sure can. I think the issue at hand is a different than usual manifestation of geocentristic patterns of thought. If we consider that the stars in our sky aren't necessarily stars and exist within the gravitational limit of this solar system, then we must consider that the bodies we observe in our sky are subject to the same scalar expansion and movement relative to the natural reference system as is the Earth. From what I gather in discussion with a couple of folks better versed in the RS than I, the construction of the pyramids could have occurred on a smaller planet and the relationships that we see today were as valid then as they are today due to locking into a node of harmonic stability that holds as a constant even though things are expanding. For anyone that might have difficulty with this, I've found that the word and concept of "relationship" works very well as an effective substitute for Larson's "motion". daniel wrote: So you can assume that statements like Ben-Ben, etc., are a lot of Poo-Poo. The Ben-Ben traces back to the Benu bird, better known as the phoenix. Taking these stories in the context utilized in the daniel papers, the phoenix is just a mythological representation of the Gods' personal vehicle, specifically the god Shamash of the Mesopotamian pantheon, and its travel from Baalbeck to the Egytptian city Annu/Heliopolis. The Ben-Ben as an actual stone just seems to be the remnant from a time where a flying vehicle of some kind landed and took off from flat topped pyramidal structures such as ziggurats. I completely agree; one can infer that they were using chemical rockets at the time, much like we do now, where the launch spews fire and the "bird" flies out of it, towards the heavens. Where would pole shift types of events fit into all of this? I believe that Daniel's pal Mr. Wilcock, purports that Ra et al, more or less summoned the structures into being using sound and, perhaps, alchemical means. I read more recently that some "confirmation" was made (using "electron microscopy") that the blocks may have indeed been cast. Even as a new comer, way back, the engineering feasibility seemed preposterous (for humans); but maybe, like many things, the "tools" implemented were simply lied about. I'm curious as to what Daniel may know of such details -if any. The root of the problem is that these are HARMONIC structures. Orbital distances, periods of orbits, sizes of planets... they all form discrete, harmonic ratios (a ratio is "motion," upon which the Reciprocal System is built... ever notice that Helium has atomic displacements of 2-1-0... an octave? Or Argon, 3-2-0... a perfect fifth? or Xenon, 4-3-0, a perfect fourth? This is unbelievably fascinating. I haven't even tried yet to explore Larson's notation system of atomic displacements, or the fourth displacement added later in RS2, beyond comments made here and on AQ. The musical ratios, however, I have spent time with and I always wanted to know if the Universe behaved musically (harmonically). So now it looks like chords can be constructed with the elements. How incredible is that? So, of you took argon's 3/2 ratio and raised it by a 5/4 major third, you are beginning to build an argon major chord. 3/2 raised by (times) 5/4 is 15/8, which is a major seventh. If you tried to plug in some musical notes using the key of C, then 1-1-0 is a C and the 3/2 fifth would be a G ( C D E F G). Raising G by a 5/4 major third gives you a 15/8 major seventh, which would be a B (C D E F G A B). To finish the chord, go up a 6/5 minor third from 15/8. 15/8 times 6/5 takes you to 9/4, a major second, which in the key of C would be a D. Now you have an argon major chord where 3-2-0 is the root of the chord (G), 15-8-0 is the third of the chord (B), and 9-8-0 is the fifth (D). The reason I didn't use 9-4-0 is because I dropped the D down an octave to express the chord within one octave of the beginning note C, but technically 9-4-0 would be correct. This would make so much more sense on a dry erase board. I'm not even sure if 9-4-0, 9-8-0 or 15-8-0 actually exist in Larson's system. But this concept is just amazing. The LMs probably use this harmonic system intuitively and probably don't even need the numbers. As always thanks for your detailed replies. The Ben-Ben as an actual stone just seems to be the remnant from a time where a flying vehicle of some kind landed and took off from flat topped pyramidal structures such as ziggurats. So the pyramids and other structures like it were a landing sites where the Ben-Ben stone was left upon take off, were the pyramids/similar structures some sort of charging device for the vehicle being built over living water? I have some rough notes from a video by Vincent Bridges on the history of the Ben-Ben. - Ishmailies stole form MEcca and passed to Cairo which started the transmutations again in the 11th century. - given to Harun the 'mad' Kalif who then thre the Christians out of Jerusalem which kickstarted the crusades. - Set up of Swiss banks. - Sir Richard Francis Bacon in disguise went to Mecca and found the stone in the Kabaa was the same as a Bin Bin in Egypt. - Like most things this then leads to John Dee and Kelley!! It would make sense the the stone was left from the vehicle and highly prized as a stone from the 'Gods', can it really trans mutate base metal into gold? Was this what set up the Swiss banks? Just as today creating money from nothing. I think i'm mis-underestimating how this "new age" misdirection works, a lot of stuff I read on here sounds like it would be 'New Age', I am not sure I am understanding where the differences are. Surely actual observations of the measurements equaling important measurements contained within the earth are not to be disregarded? Are you saying these numbers have just been 'fudged' to make it work? I am finding slightly different measurements after looking more. Again wouldn't this have altered after an expansion? Or has it expanded uniformly? Is this what you mean by 'discrete units' and not a flow of growth? You also mentioned in another post about black obsidian pyramids created by the Cyclopeans, what are these? I cannot find anything on them. With regard to the harmonic ratio that is currently above my station! I've had to rethink this over the years; in the past, I found evidence that the crust was floating on the asthenosphere and could easily slide around (take a balloon, cover it with thick oil, then smear with mud and let it dry. When the balloon expands, the dried mud cracks and slides around a bit). But after examining the amount the Earth grows during expansion events (some 5000 miles when the Arctic ocean opened up), I now believe that most "pole shift" events are just remnants of the magnetic orientation of rocks that have moved thousands of miles--the actual magnetic and rotational poles pretty much stay where they are. When they do the drifting pole research, they aren't actually finding POLES, but only examining the magnetic orientation of the rocks in the ground. Pole could have moved, or the ground could have moved. No way to tell the difference.